Cell, the most prestigious international journal in the field of biology, is today publishing a set of three papers on renal cancer. Among the authors of these papers is Dr José Ignacio López, head of the Pathological Anatomy Service of University Hospital Cruces and tenured lecturer in Pathological Anatomy at the UPV/EHU's Faculty of Medicine and Nursing. "It is about identifying the different molecular alterations that have to do with the onset and evolution in terms of timeframe and location of renal cancer; this work has been conducted by an interdisciplinary group based in the United Kingdom called the TRACERx Renal Consortium in which I am actively involved," said the researcher. 300,000 people a year worldwide are diagnosed with renal cancer, and it is the seventh most frequent malignant tumour in the western world. The TRACERx Renal Consortium is a multidisciplinary group of basic scientists and clinical doctors that prospectively studies hundreds of cases coming from various hospitals in the United Kingdom. 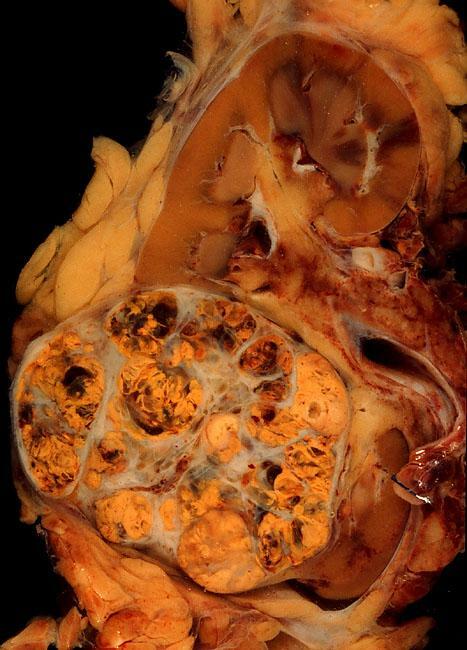 The studies focus on the renal carcinoma of clear cells, by far the most frequent and aggressive renal tumour, and further knowledge of the mechanisms underlying the development of a disease that is a major health problem in the western world. Getting to know the intrinsic mechanisms of this malignancy is the first step towards achieving an effective treatment. One of the three papers describes "a series of molecular events that occur without symptoms in childhood and in adolescence, and from which the renal cancer is going to develop several decades later. The event involves the exchange of genetic material between the short arm of chromosome 3 and the long arm of chromosome 5 through a mechanism known as chromothripsis. This entails the inactivating or silencing of a series of tumour suppressor genes, an absolutely fundamental event if the renal carcinoma of clear cells is to develop". Another of the papers published describes the evolution in time and space of clear-cell carcinoma. "Although the evolution of the tumours has until recently been regarded as a stochastic (non-deterministic) process, we have found up to seven possible deterministic profiles of the genomic evolution of clear-cell renal carcinoma, which is directly linked to various levels of aggressiveness," explained López. The final paper deals with the similarities and differences in genomic profiles between a series of clear-cell renal carcinomas and their corresponding metastases, establishing patterns with different metastatic potential. "The recognising of these profiles could lead to being able to predict what type of metastasis (where, when, how) can be expected in each case," said the researcher. Despite not obtaining definitive results for treating this disease, López highlights that these studies "are adding very valuable new information to what was previously known". The three studies have been worthy of publication in the journal Cell simultaneously, which endorses their importance. This constitutes "an unprecedented milestone for me as a researcher and for the University of the Basque Country, given that it is a highly competitive international journal in which it is very difficult to get work published", concluded López. José Ignacio López, head of the Pathological Anatomy Service of University Hospital Cruces, a member of the Biocruces Institute of Healthcare Research, and tenured lecturer in Pathological Anatomy at the UPV/EHU's Faculty of Medicine and Nursing, signs as a co-first author with equal contribution towards two of the three papers on renal cancer published today the the journal Cell. Dr López participates actively as consultant pathologist of the TRACERx Renal Consortium (Tracking Renal Cell Cancer Evolution Through Therapy), which is made up of a multidisciplinary group mainly located in the United Kingdom. Dr López's contribution in these studies being published today was the analysis and histological characterisation of thousands of samples taken from hundreds of patients, as well as the design of part of the studies and their link with molecular analyses. Dr López currently continues to participate in other studies by the TRACERx Renal Consortium and the results it obtains are also expected to be published in the future in leading global scientific journals such as Cell. Samra Turajlic, Hang Xu, Kevin Litchfield, Andrew Rowan, Stuart Horswell, Tim Chambers, Tim O'Brien, Jose I. Lopez, Thomas B.K. Watkins, David Nicol, Mark Stares, Ben Challacombe, Steve Hazell, Ashish Chandra, Thomas J. Mitchell, Lewis Au, Claudia Eichler-Jonsson, Faiz Jabbar, Aspasia Soultati, Simon Chowdhury, Sarah Rudman, Joanna Lynch, Archana Fernando, Gordon Stamp, Emma Nye, Aengus Stewart, Wei Xing, Jonathan C. Smith, Mickael Escudero, Adam Huffman, Nik Matthews, Greg Elgar, Ben Phillimore, Marta Costa, Sharmin Begum, Sophia Ward, Max Salm, Stefan Boeing, Rosalie Fisher, Lavinia Spain, Carolina Navas, Eva Grönroos, Sebastijan Hobor, Sarkhara Sharma, Ismaeel Aurangzeb, Sharanpreet Lall, Alexander Polson, Mary Varia, Catherine Horsfield, Nicos Fotiadis, Lisa Pickering, Roland F. Schwarz, Bruno Silva, Javier Herrero, Nick M. Luscombe, Mariam Jamal-Hanjani, Rachel Rosenthal, Nicolai J. Birkbak, Gareth A. Wilson, Orsolya Pipek, Dezso Ribli, Marcin Krzystanek, Istvan Csabai, Zoltan Szallasi, Martin Gore, Nicholas McGranahan, Peter Van Loo, Peter Campbell, James Larkin, Charles Swanton, and the TRACERx Renal Consortium.